Join Tamron for our 2019 Benefit Seminars and One Photo Walk. 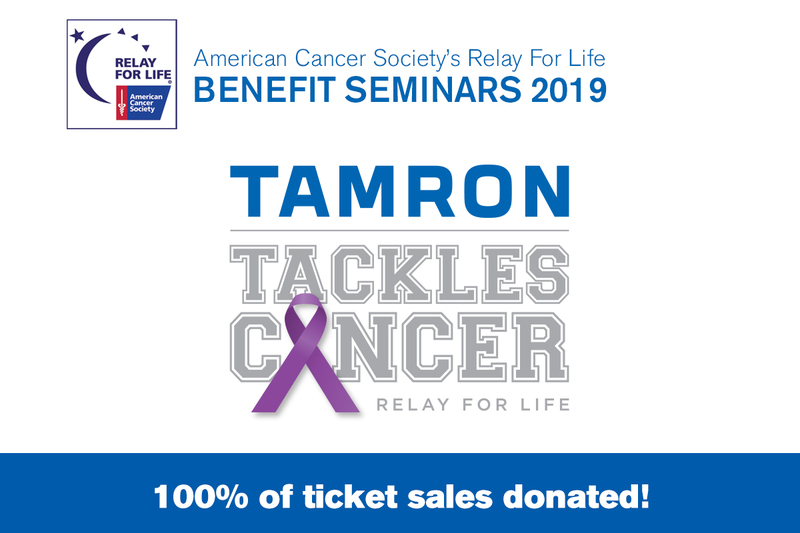 100% of the ticket will be donated to the American Cancer Society through Tamron’s Relay for Life Team, Tamron Tackles Cancer. Sign up for one or all five! Consider joining the team at http://www.main.acsevents.org/goto/tamronusa and walk with us relay on June 8th at Northport High School, Northport, NY. Bruce will cover the basic principles of capturing great action photography as well as advanced techniques. Topics will include camera settings and appropriate lens selections, how to handle diverse lighting and a wide assortment of tips and techniques that will make your photography stand out from the rest of the crowd. Join David as he shares images and discusses settings and equipment to help capture wildlife images. He will share how to prepare to photograph wildlife, whether in your backyard, a hike in the woods, or in a National Park, including building your own outdoor studio environment in your backyard that prepares you for time in the wild. Join Tamron Image Master David Guy Maynard in an immersive journey into photographing the smaller creatures nature has to offer. From frogs and flowers to bees and bugs, David will discuss his techniques and approach for obtaining breathtaking macro/nature photos. Join André as we explore street photography and the architecture of the wild west side, one of the most interesting neighborhoods in New York City. From the world famous High Line to construction of the new Zaha Hadid building, to the extension of the 7th avenue subway, this urban landscape is a treasure trove of visual imagery.